Beautiful pre-finished solid Red Oak flooring, requiring no on site sanding or finishing. Supplied as standard in random widths (recommended as random widths of flooring produce joints which are not uniform making them more difficult to detect and therefore making the floor appear as if one solid piece of timber) as shown in illustration (105mm –205mm). Prime grade flooring is free from any defects or knots and is even in colour. Prime boards comes from the heart of the trunk of the tree i.e the best and most expensive cuts of timber. Ideal if you want a clean, minimal or modern look. 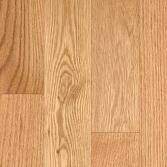 Character grade flooring is as the name suggests flooring boards which have character. Boards would generally feature small natural knots and natural timber defects although all knots are filled and sanded and there would be more colour variation. This type of floor becomes a real feature in itself and every floor will be unique, trees are like people, every one is different. Selling all grades ensures none of the tree is wasted.